The N.C. Chronicles. : Pushing alternative sexual behaviour, eliminating genders and parents.Using our kids to do it. Pushing alternative sexual behaviour, eliminating genders and parents.Using our kids to do it. US passports to delete the words "mother" and "father"
So on, so on....Not In Canada yet? Wait....It's coming. I have written about this awhile back, were in sweden they eliminated the word his and her and replaced it with hen...Now, Ironically in North america, HEN is a female chicken...lol. 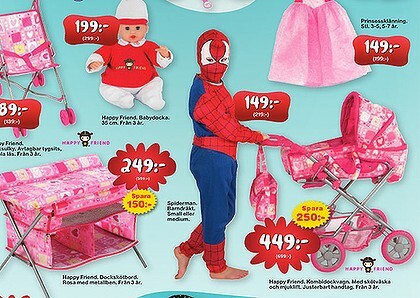 Nevertheless, now, over there, as one can see, selling spider man outfit to boys pushing a stroller. What next "thing 1 and thing 2". This crap, and it is crap, is been pushed in america by the obama administration, and if anyone thinks that it has no repercussion on kids, I strongly suggest we look deeper into their behaviour. Confusion now rules the school yard, when one of my kids was going to the local catholic school in perth ontario, St-John's catholic high school(ironically) which at the time was controlled by a left wing feminist who had anti parent tendencies, deanne strong vice principal(Fired)), my daughter and other girls would talk about how half the boys there would say they were gay, not that they were, but it was, according to what they heard, a fad. That is the problem, when you push an agenda such as the feminists and gay lobby has, (a very small minority in society), it can be taken as a fad by kids, and that is what confuses the young, they are not ready for the repercussions and get into trouble doing it...Sometimes this confusion results in depression and even suicide. It also promotes disrespect for the traditional family and mom and dad, it puts parents, who know their kids better than anyone in schools, in a difficult situation. I was talking to a parent who took his kids out of this school for this specific reason, when his child told him he was gay. And guess what, as soon as he went to a different school who was not pushing this agenda, the boy had a girlfriend. Now, in my honest opinion, it's not that they are promoting this specific agenda, it is a tool, for the main one, the destruction of the traditional family, spirituality, we can see this by their adaptation of the word patriarchy as a vile status in families(according to them), not knowing that in some society Patriarchy and Matriarchy defines the Elders. The advancement in the destruction of families is in full swing in Europe, and of course, been pushed by the obama administration, France has join the fray as of late, and all this to please 3% of the population??? As I said, not one bit, it is been used to destroy conservative behaviour and advance their own left wing power base at the expense of our families and especially our children, it is all political. The stupidity of all this is, pushing the minority's agenda on the majority is always a dangerous path to take, historically, if things go wrong and looking at our economy, it's just a matter of time, people have a tendency to blame someone for what transpired. It is no secret anymore that this minority, especially what is left of the feminist movement, is at the forefront of destruction of traditional family life. We did not have rampant teen suicide, parental disrespect, drugs, crime, teen pregnancy, welfare dependency, as we have it now. When families had the last word in raising the young, things where better, yes problems here and there, but not in the numbers we have today, so if we are to point a finger and say things are getting worse, I say point it at those who use our kids for political purposes and greed. I think, and this a based on people I have talked to, the very few are underestimating how conservative minded people really are. They base their opinions on those around them, not the population at large. For instance, the cbc always have polls, when they ask a question, they get a result based on those who watch the cbc and that is not the full picture. Therefore they promote the poll as fact, when it only represent the people who watch the cbc, and not all Canadians do. The cbc is well known to be pro liberal, a left wing station, with a left wing audience. Hence the results are always according to the opinions of "their" audience. Go to sun news and ask the same question and you get an opposite of what the cbc result is. Men and women will always get along perfectly well if left alone.